Outputs: Excel file open in another application? When I try to update an Excel file I get the attached error, even though I do not have the file open in Excel? Please can I get some assistance. Are you using the latest version of Omniscope 2.9? Are you using a DataManager Data file output publishing block to export to Excel, using the Excel direct writer and are you expecting to Replace workbook, Replace worksheet, Replace data or Overwrite data? Can you post a screenshot of the DM Data file output publishing block with your settings? I am currently using 2.8. 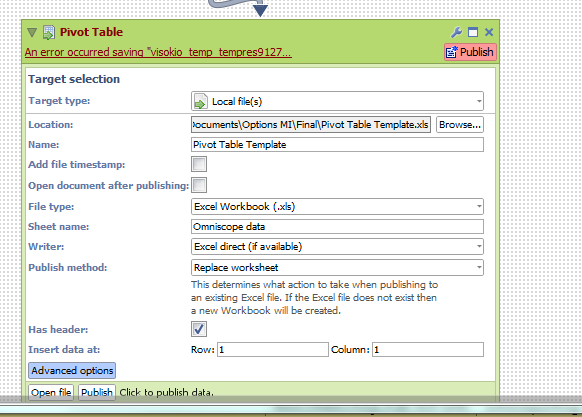 I am using the Excel direct writer and expecting to replace worksheet. 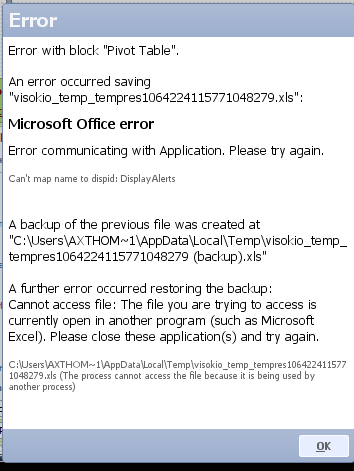 When I try to publish the file omniscope seems to open an temporary excel file that doesn’t appear to me (when I tried to delete these temporary files it said that I already had them open). It turns out that when you choose a pivot table to automatically refresh from data, this makes the omniscope raw data output not work. Once I turned off this option everything was fine. Yes...using this option in Excel can lock the Excel file and prevent Omniscope from accessing it.